It’s that time of year again in Iowa where the costumes come out and the pumpkins receive their carvings. Halloween in Iowa can provide something for everyone, and spread across the state are plenty of outlets to really enhance your Halloween experience. From one of the best candy shops in the country to a handful of nightmare-inducing haunted attractions, whether you are looking for a trick or a treat, the state of Iowa can provide the perfect Halloween for you. Serving as your one stop shop for sweets in the state of Iowa, Main Street Sweets of Cedar Falls has a big enough selection to satisfy your sweet tooth for years to come. While the Lagomarcino Chocolates give warrant to a visit alone, as well as their home-made sugar cookies, for Halloween headquarters, the huge selection of bulk candy at Main Street Sweets is what you want to really check out. Located in the historic Oakland Cemetery northeast of the Downtown District, the Black Angel statue has many homegrown traditions surrounding its eerie demeanor. Whatever the real story is, one cannot argue that it’s a spooky sight to see anytime of the day. Give respect to the cemetery and you can see the Black Angel yourself, just hope that it’s not the last thing you ever lay your eyes on. If you are looking for a great costume purveyor in Iowa, look no further than the historic Valley Junction of West Des Moines. There you will find the Theatrical Shop and three stories of costumed fun. The Theatrical Shop offers costumes throughout the year for school plays and special events, and you can bet this unique and locally owned store really comes to life during the Halloween season. Whether you want something simple to wear while answering the call of trick-or-treaters, or you want a full-fledged disguise, the friendly staff and massive inventory of the Theatrical Shop has you covered. Home to one of the most gruesome crimes in Iowa history, the Villisca Ax Murders occurred in 1912 and took the lives of eight people. In current times, visitors to the now infamous house in which the murders took place can opt for either a daylight tour or overnight tour, both of which can get the imagination running. Brave the supernatural elements however, and you can say you survived a night in the Villisca Ax Murder House. Favorite picture from todays adventure. No filter. An ongoing tradition in the Des Moines community for nearly three decades, Night Eyes at the Blank Park Zoo is a family-friendly, merry-not scary event filled with treats, colors and magical characters. With intricate designs and time put into the lighted displays of Night Eyes, the adults can appreciate the atmosphere just as much as the children, making for a memorable Halloween outing worth looking forward to each year. Taking place in the picturesque Reiman Gardens of Ames, Spirit in the Gardens encourages every member of the family to come participate in the fun. Whether you opt for the trick-or-treating throughout the garden, or you listen in on Storytime hosted by local librarians, one thing that no one can miss when attending the Spirit in the Gardens is the hundreds of carved jack-o-lanterns proudly lit up and on display. Located in Jones County on the eastern part of the state, Edinburgh Manor is one of the most truly haunted places Iowa. Edinburgh Manor’s origins stem from a poor farm, where low-income farmers could find shelter. From there, Edinburgh Manor housed the incurably insane and mentally unfit until 2010, when the institution finally shut its doors. Today, Edinburgh Manor is brimming with paranormal activity that can be seen and heard through both day tours and overnight stays for the truly brave. If you are looking for a great place to show off your creative costume, or you just want to see the creativity of others, the annual Costume Contest at Snus Hill Winery delivers it all. 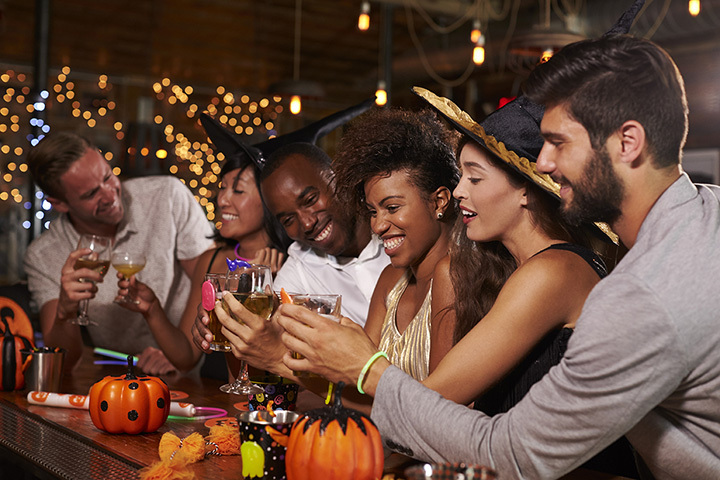 Not only does this local winery provide some great libations to smooth out the night, but with a booming sound system, big crowd and plenty of costumes to appreciate, this is one Halloween party you don’t want to miss out on. The Heart of Darkness is more than your average haunted house, it’s an entire haunted complex filled with elaborately themed haunted attractions. Ranging from the House of the Dead to the Killer Circus, the Heart of Darkness is literally what nightmares are made of. If you feel brave enough to venture through all the elements, perhaps the Black-Out Tour on Thursdays are right for you, where the intensity gets kicked up a notch through the characters that can grab you. Join the Cedar Rapids community this Halloween for the annual Haunted Halloween Ball. Featuring live performances, photo booths and spooky decorations to put you in the mood, the Haunted Halloween Ball is also throwing down over $2,000 for their costume contest. Not only is the Haunted Halloween Ball a real fun time, but all proceeds for this city-run event go towards local charities, making this festive event much more of a treat than a trick.